Bookkeeping should be easy. Actually, it can be easy if you use a smart accounting worksheet. Let me explain what I mean with that. A good accounting worksheet should offer an integrated solution for your accounting needs. All recorded transactions (sales, purchases, cash and bank transactions) must be automatically linked to financial statements and reports. Inputting data into an accounting worksheet should be quick and easy. No popup screens, no endless clicking. Just a simple table to fill. Flexibility. All businesses are different. Therefore, a good accounting worksheet offers you multiple possibilities to adjust the template to your needs. No macros or VBA please. If an accounting worksheet contains macros or VBA, you run the risk of errors and Excel shutting down. And what about the risk of viruses? 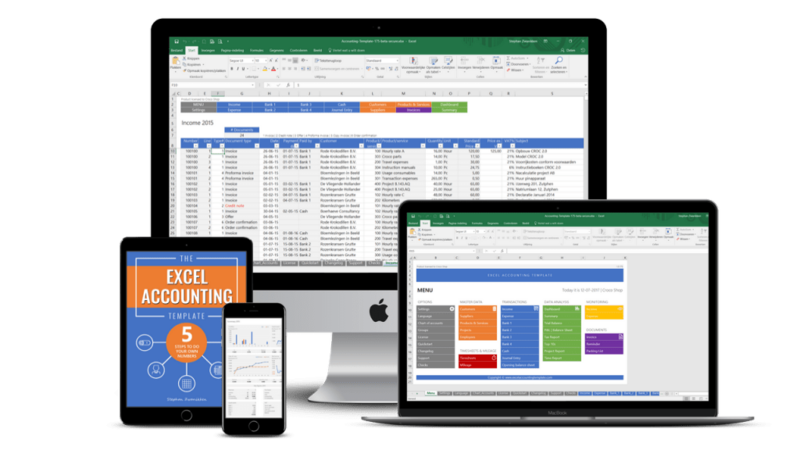 Try the Excel accounting template now. You will discover how easy it is to do your own accounting in Excel.